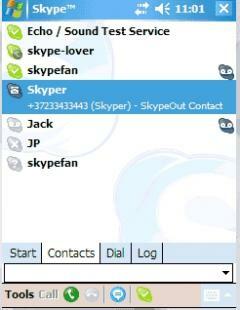 Skype on the go with Skype for Pocket PC. Make voice calls and chat for free, no matter where you are. It's easy to use and available when you connect to WiFi or 3G. · Profile personalization: Users can take a picture with the camera on their mobile device and immediately update their profile. · Send files - Free to send spreadsheets, photos, music and other files Skype-to-Skype. · Send texts (SMS) - Great value texts to mobiles abroad, and a great way to avoid roaming charges abroad if you text on Skype from a WiFi zone. does it work on htc s740? i juse imate8150 ..verson6.1? but i want to some need soft/ just like dictonary/map/ well wallpaper/and much more beter...? ?so u suggest me how i install..some softwere/? ?i have downlode some soft/ but not success...plz u tell me my problem solve..?? can not sign in, why? ?